Lessons for Life - English: The Complete Set includes 10 full programs. Now includes AudioMate CD, so you can take your lessons on iPod, MP3 and CD where ever you go! Lessons for Life Beginner Level; Intermediate Level; Advanced Level; Practical Grammar Part 1; Practical Grammar Part 2; Practical English Conversations, Interactive English Games, AudioMate Beginner, AudioMate Intermediate, and AudioMate Advanced Level. Fast & fun learning with full immersion, multimedia language learning program for all individual learning styles. It is easy to use, with simple, intuitive, clear navigation, making learning an enjoyable and rewarding experience. Now includes the AudioMate CD, so you can take your lessons on iPod, MP3 and CD where ever you go! Guided assistance is offered in Arabic in order to help make learning as easy possible. Guided assistance is offered in Indonesians in order to help make learning as easy possible. Lessons For Life - English for Indonesian Speakers develops specific skills needed to optimize your TOEFL/TOEFL IBT, TOEIC/TOEIC IBT, EILTS scores and succeed in education and business, including reading, writing, listening, spelling, dictation, speaking, vocabulary, grammar, and culture. Guided assistance is offered in Persian (Farsi) in order to help make learning as easy possible. Guided assistance is offered in Russian in order to help make learning as easy possible including reading, writing, listening, spelling, dictation, speaking, vocabulary, grammar, and culture. Guided assistance is offered in Thai in order to help make learning as easy possible including reading, writing, listening, spelling, dictation, speaking, vocabulary, grammar, and culture. Guided assistance is offered in Turkish in order to help make learning as easy possible. Lessons for Life - Practical English Grammar is a fully comprehensive software program providing training and lessons in all essential grammar areas. It is fun and easy to use with simple and clear explanations that help you through the activities and feedback to help you measure your progress. 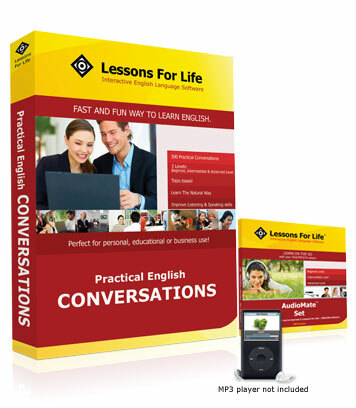 Lessons for Life - Practical English Conversation provides training and practice in onversation, pronunciation and vocabulary. You'll see, hear and practise interesting conversations. You'll learn everyday vocabulary, expressions and pronunciation. By imitating native speakers, you'll learn to speak English FLUENTLY.